Marius Ungureanu, viola; Muriel Cellier & Matthias Hehrmann, cello; and Verona Maier & David Strong, piano are playing music from Bach, Poulenc, Chopin, Dediu, Debussy, Schubert, Shostakovich, Beethoven, Satie, Berger, Ungureanu and Brahms. The second edition closes with yet another Cauldron of Zoran, a cooking-concert with all sorts of musical and digestible ingredients. When God awakened from his second primordial sleep, to (once again) recreate himself, he found the world barren and dead. There was a huge and oppressive silence, he was feeling cold and eldritch. He thought about the good old days between his first and second primordial sleep. He didn't want to wait for 6 more days in order to once again invent humans, who afterwards should fill the world again with bluntness and grief on his behalf. Quietly he built a huge pot, casting all his memories and experience about the good old days into the pot and stirring thoroughly for some thousand years untill the sticky mash, from which he would make new humans, came into being. But as all work of art has it's life of its own, it happend that the millenia long dammed mixture swelled, becoming bigger and bigger, bursting the pot, exploding into the sound of the new human first word: PORRIDGE! And God liked what he heard and he named his new human: Porridge. Because of the big bang, that has been provoked by the big pot explosion, the whole sticky mash was scattered all over the earth and every little clot turned into yet another human named Porridge. A self-sufficient human, being both male and female, capable to procreate himself alone. All men will become Porridge. That's how the big Porridge unity came to life. 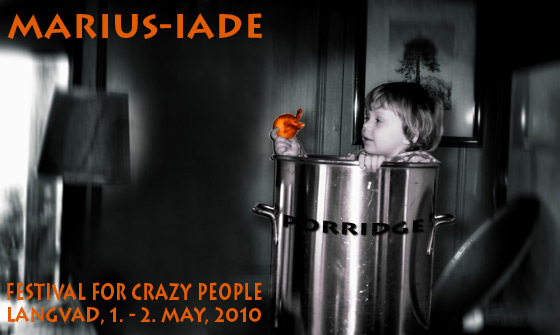 The task of this years festival is to find all sort of imaginable soundexperiences that have been catapulted outside during the second big bang, to capture them and prepare a big and sticky mash out of them, that will be called "Porridge" by custom and will be consumed at the end of the festival. This is why Porridge is the totality of the experience of God under chewing condition. We wish you sticky ears and enjoy your meal!